Russell Peters made his comeback appearance in Dubai on 20th March and it was “totally worth” the reunion we all anticipated. Dubai World Trade Centre (Sheikh Rashid Hall) welcomed over 14,000 fans from all over the country easily making it the most looked forward evening. I overheard a British couple behind me mentioning that this was the place to be in Dubai tonight- and I couldn’t agree more. Paying my ticket was a lucky shot since they sold out in minutes, only to my chagrin that the next show was announced a day earlier. Grabbing a good seat and having coffee and doughnuts, courtesy of Tim Hortons, I enjoyed the classic remixes of the signature DJ Spinbad who accompanies Russell on most of his shows. The show opened up with comedian, Ruben Paul who entertained the audience with his jokes ranging from race, his culture and of course Dubai, he even made a noteworthy mention about Karama and the bubble we all live in. Ruben Paul made the audience go wild for a good half hour before it was time for the real show stopper. Snapshot of the crowd at Sheikh Rashid Hall, Dubai taken by Peter's himself. Russell Peters was welcomed amidst a lot of fanfare, cheering and imitations. Peters went on with his usual number of finding out where the various cultures were at. His jokes targeted at Indians, Pakistanis, locals and even Filipinos came out in abundance. An audience member did have the gall to yell that things have changed, when he referenced the Kashmir sweater joke to which Peters pounced on the occasion to mention that we are all the same race of people who couldn’t possibly evolve after just 65 years and that we are not so far apart after all. This led to the audience giving an encore and demanding for more. While Russell Peters did have some fresh material, he managed to re-use some of his old signature jokes he’s very well known for. He used the audience to his advantage and kept everyone rolling in fits of laughter. He has matured as a comedian and he’s still one of the few comedians who got what it takes to use racial differences and turn them into humor. He gave us an insight into his life, his daughter and his divorce. All of this was done in a manner that made all of us laugh. Concluding the show, he made a final reference to his father and gave us an interesting observation on how we Indians tend to make sounds out the noises we hear while we communicate to each other. Needless to say, the car turn indicator noise Russell made during the show remains in my head even today as I switch on my indicator while I drive. 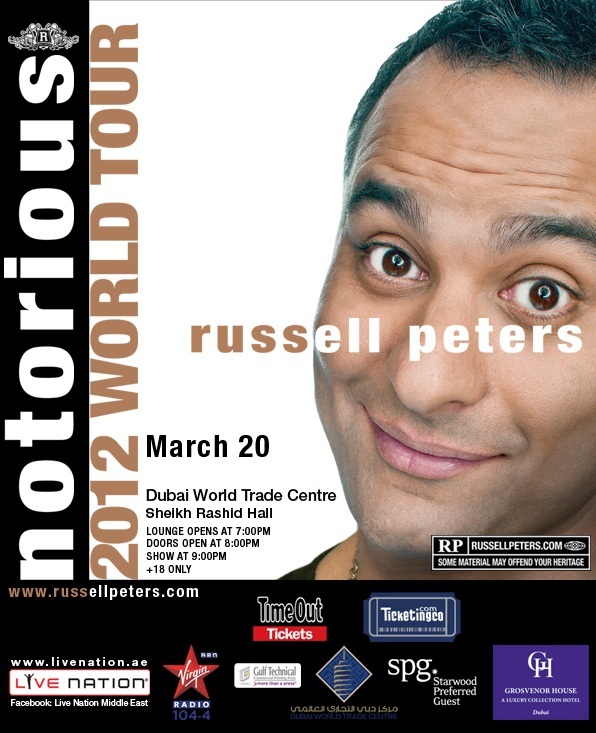 The World Tour will take Peters not only to the Middle East, but also to South Africa, Singapore, Jakarta, Hong Kong, Manila, Australia, New Zealand, Northern Europe and arenas across his native Canada and the United States and like UAE will also feature NYC's DJ Spinbad and comedian Ruben Paul. The writer is a postgraduate student studying MA Media and Communications, Manipal University, Dubai.